The BA-I, or sometimes BAI (BroneAvtomobil Izhorskij plant), was the first three-axle armored car of the Red Army. 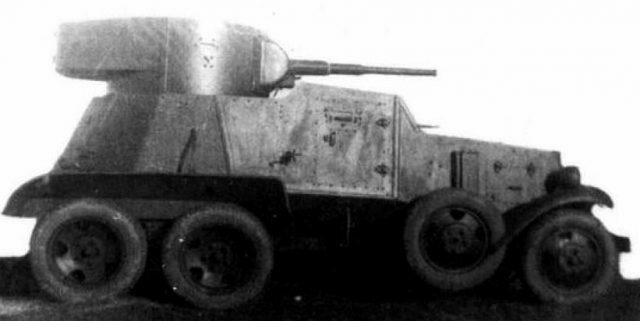 Before that, the BA-27 (1928) was the most common medium armored car in service (215 produced), and forged a pattern for future developments. It was based upon the American truck Ford-Timken. This proved a popular, but rather conservative design with two axles, a bolted hull and the T-18 light tank turret. The Army asked for a bigger model, potentially equipped with heavier turrets and, by 1932, the Izhora factory proposed the BA-I, a six-wheeled vehicle almost entirely assembled by welding. The custom-built turret housed a 37 mm (1.46 in) gun and a coaxial 7.62 mm (0.3 in) and the front left compartment (usually the co-driver position) was used by a machine-gunner. There was also an extra pair of replacement wheels, just behind the front axle (developed on the D-13), which helped crossing trenches and ditches. But their capabilities against tanks and other armored vehicles was limited due to the medium-velocity of the 37 mm (1.46 in) gun, designed primarily for infantry support, and only 82 were built until 1933. The BA-3 was an improved model, following an 1932 army specification asking for a model equipped with the T-26 turret, and its high velocity 45 mm (1.77 in) 20K gun (60 rounds), allowing excellent antitank capabilities. The armament was completed by a coaxial DT machine-gun and another in the front compartment co-driver ballmount. The Izhora plant chose to radically improved the BAI design, lengthening the rear part of the hull by 50 cm (1.64 ft) to cope with the extra top-weight of the new T-26 turret. The ring was also reinforced, as was the entire rear compartment. The riveted armor was also thickened and the engine compartment received extra exhaust vents, as the GAZ engine proved prone to overheating. It was also remarkable that it was tested and equipped with spare chained tracks for its rear wheels, for a quick conversion into a half-track. Each track comprised 25 80×35 mm (3.14×1.38 in) soft steel links and weighted about 74 kg, stored on the rear mudguards. The conversion could be performed in just 10 minutes ensuring largely improved off-road capabilities and overall versatility in operations. Like the BAI, the hull and turret were partly welded. The front compartment was higher than the rear fighting compartment, giving this model a lower profile. Access to the fighting compartment was allowed by a rear door and two hatches served the driver compartment. The suspension was of the leaf spring system. The two rear axles held double wheels, so, in fact, no less than twelve tires were needed. The hull weighed 5.82 tons, and the watercooled GAZ A M-1 engine gave a power-to-weight ratio of 8 tons/hp with a net power of 40hp@2800rpm. Top speed was 56 km/h (35 mph) on road and range about 160 miles (240 km). Tests were performed in June 1934 at the NIIBT unit, Kubinka proving grounds. Cross-country speed proved less than 35 km/h (21.7 mph) and the engine also overheated badly, imposing better cooling and a reinforced front suspension, which were added on the next series. Production was part of the 1st Five Year Plan and was partly assumed by Vyksunskij (Gorki Works), the first series based on the US-based Ford-Timken truck chassis converted into a 6×4, and later production vehicles received a new Russian-built GAZ AAA chassis. When the production ended in 1935, 180 have been delivered to the Red Army. Some limitations in the BA-3, notably the excessive weight and limited cross-country capabilities, led the Izhora chief engineer to modify the vehicle. It received a shortened wheelbase GAZ AAA chassis, a better cooled engine, reinforced front suspensions, a lighter hull now largely welded and the rear access hatch eliminated. Another innovative feature were the bullet-proof porous rubber GK tracks. However, these tires largely reduced top speed and range. The turret ring was modified to received BT turrets of similar model, but in practice, T-26 turrets were usually mounted, with a commander periscope. The 20K gun gave excellent performances. The BR-240 P shell was found capable of piercing 37 mm (1.46 in) at 500 m (547 yd). Muzzle velocity was 970 m/s (1060 yd/s). Some models received radios, the turret being equipped with the characteristic horseshoe antenna. – The BA-6M was designed in 1936 and built in 1937-38, featuring a new, lighter, conical, all-welded 10 mm (0.39 in) thick turret, a 71-TK-1 radio and a more powerful 50 hp GAZ M engine. The weight was just 4.8 tons and overall performances slightly increased. – Another variant, the BA-9 , was realized on the BA-6M basis, reequipped with a light but powerful DK 12.7 mm (0.5 in) heavy machine gun. Despite 100 being ordered by the cavalry, and due to the very limited supplies of the new machine-gun, this project was dropped. – The BA-3 Zhd was a “kit” especially designed for railways in 1936, which saw very limited production with the improved BA-6ZD. This consisted in hydraulic jacks mounted on the front and rear to lift it in position, and six adapted metal wheels to be installed over the tires. This operation was performed in just 30 minutes. – The BAZ or “Amfibyi” was an amphibious conversion attempt, which remained largely experimental. The hull was completely reshaped in a boat-like form, entirely welded, and two large sponsons took place at the front while propulsion was assumed by two 15-inch (38 cm) brass screws at the rear. These armored cars were supplied to reconnaissance regiments of tank, cavalry and infantry units. The Transbaikal military district saw an increase in material which led to the constitution of an entire brigade of three armored car regiments. 7 BA-3s and 80 BA-6s were sent to the Republicans fighting in Spain in 1937. The 1st Armored Brigade, under the command of D.G.Pavlov. took part in the defense of Madrid. They also fought at Teruel. In 1939, captured models led to the development of Spanish close-copies, which will be seen later on the Russian front (with the “Azul” division). When the war broke out in 1939, the 7th, 8th, and 9th Brigades, half equipped with BA-3/6s, were sent to the Far Eastern border with Japanese-controlled Northern China. The dry and flat steppe helped these heavy armored cars and their 47 mm (1.77 in) gun gave excellent results against Japanese tanks at Khalkin Gol. However, they proved vulnerable even to the Japanese 13 mm (0.51 in) heavy machine-guns. Some were delivered to the 6th and 8th Armored Cavalry Battalions of the Mongolian Revolutionary People’s Army, which also took part in various operations in this sector against the Japanese. Others took part in the invasion of Poland in September. Later on they took part in the “Winter war” campaign against Finland, showing good mobility in the snow with their “half-track kits”. Many were easily destroyed by Finnish antitank rifles and other lighter expedients, and a dozen were captured. They were later pressed in service as the BAF-A (BA-3) and BAF-B (BA-6) and fought on until late 1944. 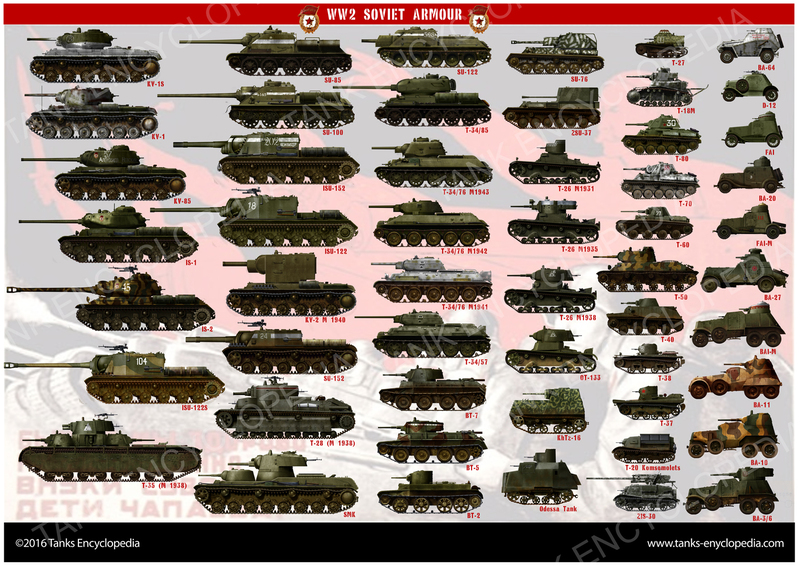 The Russian models were still frontline during the summer of 1941. However, like the BA-10, they were gradually phased out during the Great Patriotic War in favor of the new generation of mass-produced light scout tanks, like the T-60/T-70. The BA-6 was also exported to Turkey. Some sources speak of 60 delivered in 1939. The BA-10 was largely based on the previous series, but mass-produced between 1938 to 1941 (3311) with a new conical T-26S turret and a better 45 mm (1.77 in) 20K L/51 main gun. But the main improvement consisted in a more powerful GAZ MM (50 hp) engine and an increased range due to new fuel tanks. The maximal armor was increased to 16 mm (0.63 in). They soldiered well until late 1942, some being converted as turretless, stripped troop carriers. BA-3 of the 9th Armored Car Brigade, battle of Khalkin Gol, August 1939. BA-3 of the 8th Armored Car Brigade, battle of Khalkin Gol, July 1939. BA-6 of the Spanish Republican Army, defense of Madrid, May 1937. Possibly fictional colors. BA-6 of the 9th Armored Car Brigade, radio version, Nomonanh plateau, summer 1939. BA-6 during the Winter War (unknown unit) fitted with its track kits, southern Ladoga lake sector, January 1940. BA-6 of an unknown Armored Car Brigade, Leningrad sector, summer 1941. This two-tone camouflage was rare. Independent Reconnaissance Battalion of the 1st Tank Division, 1st Mechanized Corps, Krasnogvardeisk area, August 1941.